Born this day August 22, 1902 in Berlin Helene Bertha Amalie ‘Leni’ Riefenstahl was a German film director, producer, photographer, actress and dancer best known for directing the Nazi propaganda film Triumph of the Will. Recognised as the greatest female filmmaker of the 20th century she was also considered a postwar pariah by the film industry. Riefenstahl began her long and extraordinary career as an interpretive dancer. She attracted the attention of film director Arnold Fanck, and starred in five of his silent motion pictures and three talking motion pictures between 1925 and 1933. With Fanck as her mentor, Riefenstahl began directing films. Already popular as an actress with German audiences, Riefenstahl directed her first major feature film, Das Blaue Licht (The Blue Light), in 1932. The film was well received, and won the Silver Medal at the Venice Film Festival. It also claimed the attention of Adolf Hitler whose political star was on the rise. Riefenstahl in turn had heard Hitler speak at a public rally and was riveted by his oratorical style and his ability to mesmerize audiences. She directed eight films, two of which received significant coverage outside Germany. Triumph of the Will, a hypnotic account of the massive 1934 Nazi party rally in Nuremberg, glorifying Nazi pageantry and deifying Hitler, earned Riefenstahl a place in film history. Many modern commentators cast a dim view over her ‘propaganda’ films but many also cite the aesthetics as outstanding. Triumph of the Will won awards in both Nazi Germany and Fascist Italy but also ironically the Grand Prix in Paris in 1937. The film was highly acclaimed for its innovative use of camera angles some of which were achieved by cameramen working on roller skates. Following the success of Triumph of the Will, her next major film was the two-part Olympia filmed during the 1936 Berlin Olympic Games. Again Olympia’s mix of aesthetics, sports, and propaganda won many international awards, including Best Foreign Film honors at the Venice Film Festival and a special award from the International Olympic Committee (IOC) for depicting the joy of sport. The Economist wrote that Triumph of the Will “sealed her reputation as the greatest female filmmaker of the 20th century” but it was a film that would come back to haunt her. Following Germany’s defeat in World War II, Riefenstahl’s personal association with Hitler and her high profile in the Third Reich destroyed her film career and earned her the status of a postwar pariah. After the war Riefenstahl attempted to separate herself from the criminal nature of the Nazi regime, suggesting her duty was to her craft and not necessarily to the Nazi authorities who commissioned her films. She pleaded ignorance of the atrocities committed by the regime, claiming she was concerned only with images, not ideas. Despite her protests to the contrary she was condemned at large by the international film community and did not make another movie for over 50 years. After reading Ernest Hemingway’s Green Hills of Africa in 1955 she was inspired to visit the Sudan the following year. For several months she was accepted by and lived with the primitive Nuba tribe. In the 1970s, Riefenstahl published her still photography of the Nuba tribes in several books including The Last of the Nuba and Vanishing Africa documenting the vanishing beauty of African people and cultures. In her late seventies, she undertook a new interest in underwater cinematography. Active until her death at age 101, she published marine life stills and released the marine-based documentary, Impressionen Unter Wasser (Underwater Impressions) in 2002, and at 99 years of age it made her the oldest film director ever. 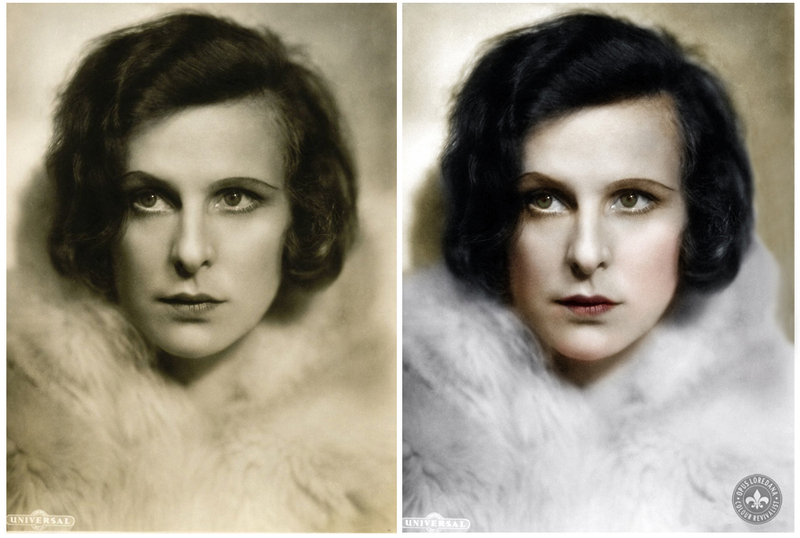 In an interview shortly before her death, Riefenstahl stated that if she had known that Triumph of the Will would have haunted her career, she would have never made it. Riefenstahl remained a controversial figure until the end of her life and went to her grave never having been able to escape her past association as a Nazi propagandist. She died of cancer in Germany in 2003, just a few weeks after her 101st birthday. Triumph of the Will and Olympia are universally acknowledged as two of the best documentaries ever made. But because they reflect the ideology of a heinous movement, they will forever evoke the classic question of the contest between art and morality; can art be detached from its context? This entry was posted in Colorization, Colourisation, History, Photography, Women, Women in Film & TV, Women Photographers and tagged Arnold Fanck, Der Tagesspiegel, Ernest Hemingway, Green Hills of Africa, Leni Riefenstahl, Loredana Crupi, Olympia Part One: Festival of the Nations, Opus Loredana, Riefenstahl, The Last of the Nuba, Triumph of the Will, Underwater Impressions. Bookmark the permalink. Fascinating story. One wonders what films she might have made were it not for Casualty of Triumph.